The EGit and JGit teams are happy to announce our 1.0 release and graduation from eclipse.org incubation! It’s been an interesting ride the past couple years that deserves a separate blog post on how moving projects to a open source foundation can be interesting and challenging. 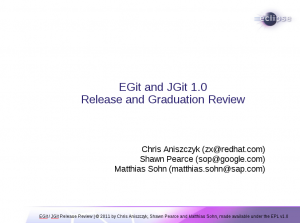 We had humble beginnings but are a lot more diverse now with many individuals and companies involved with EGit (15 committers) and JGit (9 committers). We have a variety of individuals contributing along with corporate support from Ageto, Dewire, GitHub, Google, IBM, Red Hat, SAP and Tasktop. A special thanks needs to go to Shawn Pearce (Google) and Matthias Sohn (SAP) for all their efforts and being patient with the move to the Eclipse Foundation. Our work isn’t finish yet, there are still many things to do but we hope that with more people using the tooling, we’ll get more quality bug reports and enhancements. Also, things are going to get exciting this summer when the Eclipse platform project moves to Git! In the near future, look for things like synchronize view improvements, git-stash and git-reflog support along with whatever else the community desires. In the end, we are happy to bring Git tooling to the Eclipse community and the Indigo release. I hope by the time this next year, the eclipse.org community has fully migrated to Git. It should be a hard requirement to join the Juno simultaneous release in my opinion.